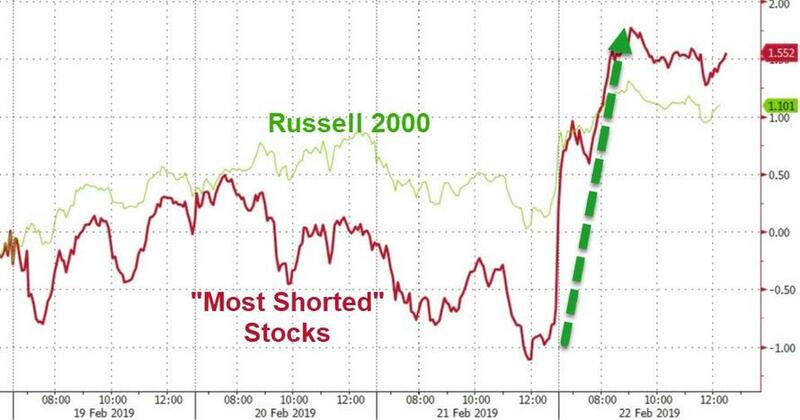 One of the recurring market themes we have observed in recent weeks is that just because hedge funds have been painfully - if only from a P&L perspective - underexposed to the recent rally in the stock market, the "pain trade" is higher and that the higher the market rises, the more investors will be forced to buy. This thesis has been most aggressively pitched by JPM's Marko Kolanovic who believes that as VIX drops, resulting in greater leverage among the systematic community, the more buyers will emerge, creating a positive feedback loop that sends the market higher for the next three months. 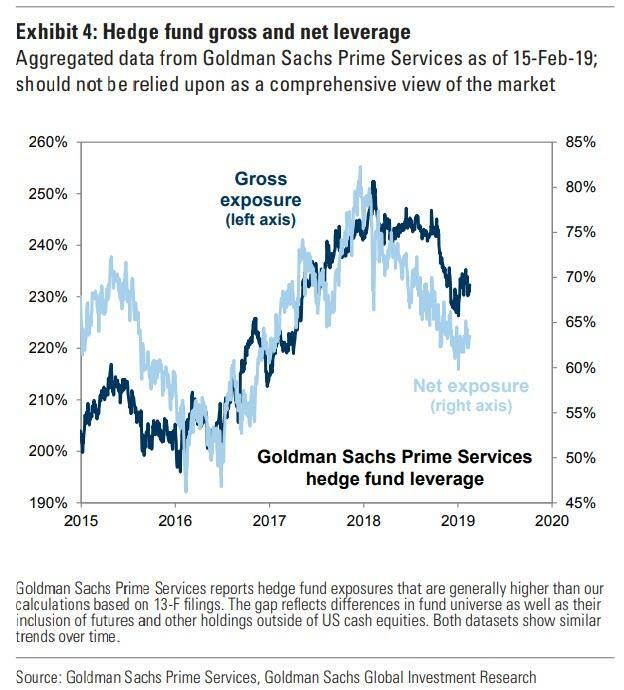 And at least superficially, this take is accurate because as the following chart from Goldman Sachs Prime Services as of Feb 15 2019 shows, both gross and net hedge fund exposure is near the lowest level of the past 2 years. As noted earlier, in its latest hedge fund monitor publiations, Goldman said that hedge fund gross exposures have rebounded modestly alongside the equity market "but remain well below levels registered during most of the prior 18 months", and adds that at roughly 230%, current gross exposures are similar to levels in late November 2018. Yet while it is hardly a secret that hedge funds have been underexposed to the market, where confusion remains is why hedge funds - despite assurances by the likes of JPM that it is only a matter of time - have so far refused to jump into stocks. In fact, as we reported earlier, US equity funds saw another $4.6 billion outflow in the latest week, the 12th consecutive week of outflows according to BofA, in other words for the entire duration of the past 9 weeks rally, investors have been continuously selling stocks even as they have been aggressively bidding up every fixed income product. But while it remains a mystery why professional investors continue to boycott the market even as the S&P is rapidly approaching both 2,800 and its Sept 2018 all time highs, we now have a good idea of what has caused the relentless lifting in the market, even without the aggressive participation of retail and institutional investors (who, in fact, have continued to sell risk assets). The answer, which we doubt will come as a surprise to many, is that in addition to buybacks which as noted earlier today are tracking some +91% higher compared to the same period in 2018 according to BofA client data suggesting another record year for stock repurchases, is stock buybacks. 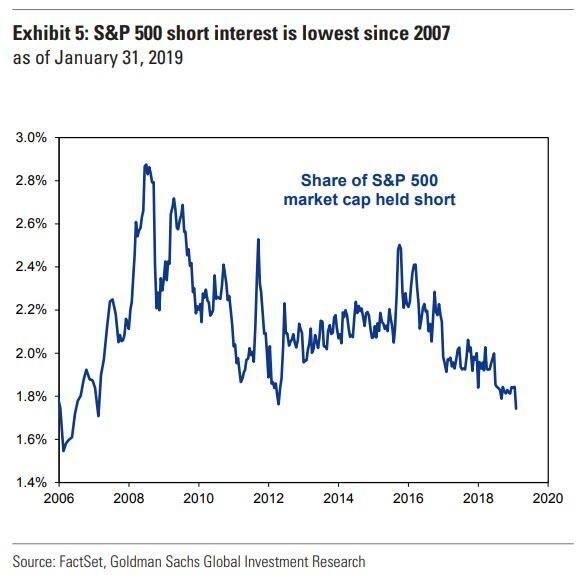 For the evidence we once again go to Goldman which notes that mirroring the decline in gross exposures, the share of S&P 500 market cap held short is now at the lowest level since 2007, and as shown in the chart below, after peaking at 2.5% in 2015, just ahead of the Jan 2017 Shanghai Accord, short interest as a share of S&P 500 market cap has continued to slide lower and now equals just 1.7%. 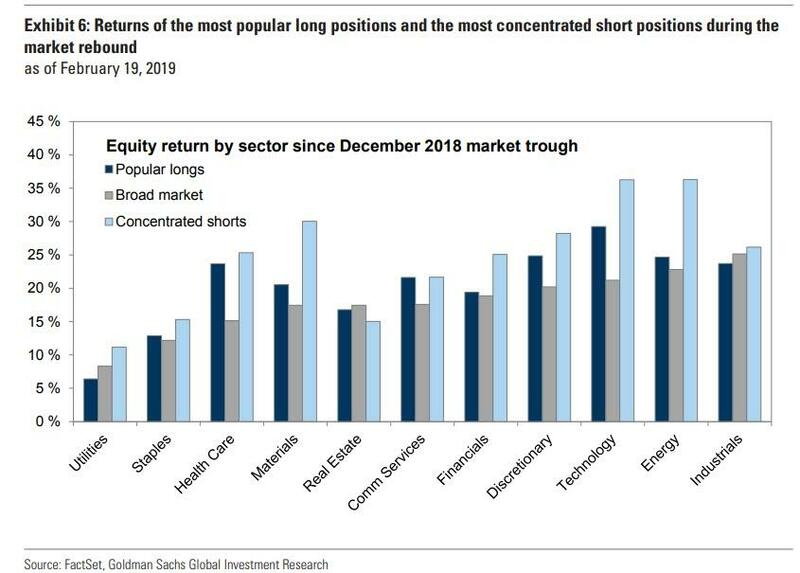 And whether the short squeeze has been forced or due to funds covering bearish exposure, this dramatic reduction in short activity has resulted in stocks with the highest ratio of short interest to float cap to significantly outperform in most sectors during the recent market rebound, as shown in the next chart. 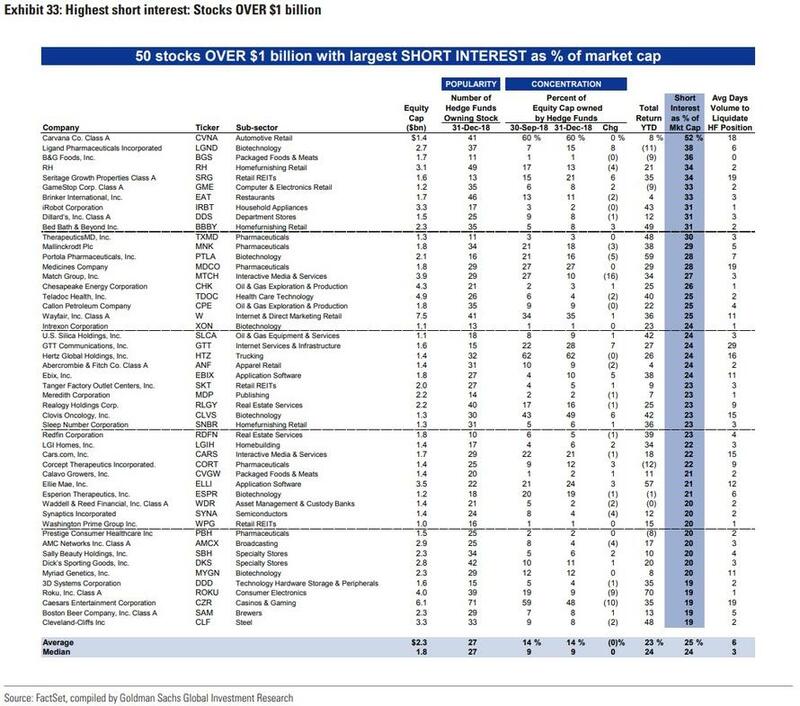 Two final observations: as shown in the next chart, the 50 stocks with market caps larger than $1 billion with the highest short interest outstanding relative to cap have posted a median YTD return of 24%.